For the second time in 10 weeks, Fannie Mae is toughening its mortgage guidelines again. Again. According to an internal Fannie Mae document, a review of the group’s current “risk appetite, eligibility requirements, mortgage insurance options, and pricing” spawned changes spanning credit scoring, income requirements, loan-level pricing adjustments. It’s the loan-level pricing adjustment part that’s most interesting. Loan-level pricing adjustments are specific fees assessed for specific risks. Based on the current lender guidelines, if your credit score is low, you’ll pay an extra fee to Fannie for your mortgage; if you’re doing a cash-out refinance, you’ll pay an extra fee to Fannie for your mortgage; if you live in a condo and have little equity, you’ll pay an extra fee to Fannie for your mortgage. LLPAs were first introduced in April 2008. Fannie Mae has upped them nine times since. There’s lot of ways to trigger the fees. If the concept of risk-based fees seems weird, think of LLPAs like auto insurance. Base rates are the same based on product, but the driver of a sports car will pay for insurance versus, say, the driver of a minivan. Higher risk to the insurer means higher premiums to the owner. Mortgages work the same way. At least with its latest LLPA revision, Fannie Mae gets a tiny bit democratic. It gives its mortgage-insurance carrying homeowners a choice. For every borrower, there is a clear-cut, cost-effective solution but, regardless, in both cases, the costs to finance through Fannie Mae are going to be higher. 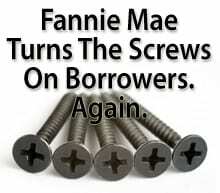 Fannie Mae set December 11, 2009 as its “effective date” for the changes. All mortgage approvals after that date will be subject to the new minimum FICOs, expense ratios, and LLPAs. Better to get a good rate today than to be ineligible for a great rate tomorrow. If I can help you plan for an upcoming mortgage, call. Freddie Mac’s Home Possible Versus Fannie Mae’s HomeReady: Which Is Better? Home Possible Advantage, offered by Freddie Mac, and HomeReady, offered by Fannie Mae, are similar programs for homebuyers without large down payments. Here’s an explanation of the program differences, and how they might matter to you. What’s happening with the government shutdown and mortgage closings? Find out how you will (or won’t) be affected. A mortgage rates drop can save you money. Be sure you’re ready to take advantage when this occurs.